As far as I’m concerned, hairy bittercress (Cardamine hirsuta) is neither hairy nor bitter. While the leaves have a slight pubescence (you need a hand lens to see it) it is certainly not objectionable as a fresh green. As for bitter, I prefer to classify the flavor as slightly pungent and peppery, like a really mild horseradish or mustard. The taste reminds me of kale, and the tender delicate texture, similar to alfalfa sprouts, makes it ideal for a salad. Bittercress is an annual in the cabbage family and thrives in cool weather. In eastern North Carolina, that means from November until mid-April. After that the plants generally go to seed and quite likely might be bitter or at least hot like strong horseradish by then. I never eat them once they set fruit. Leaves emerge from the stem one at a time, but each leaf has multiple leaf blades. The plant has a circular growth habit. A basal rosette of leaves eventually gives way to spreading stems. The flowers are composed of four white petals and are borne in terminal clusters. Once they flower the plants mature rather quickly and soon form long slender pods called siliques. When these are ripe you’ll know it. Just touch one and watch it spew seeds everywhere. As you might guess they can be difficult to control if you don’t want them. 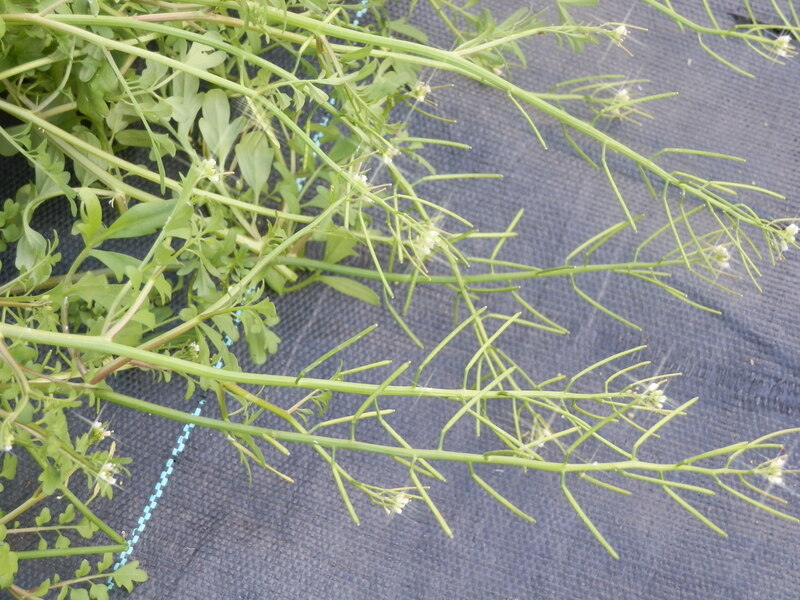 The seeds are so prolific that you’ll want to spray or hand weed them before they mature. These plants develop quickly, going from seedlings to adult plants in less than a month. Seeds usually lay dormant through the summer and germinate in mid to late fall. Bittercress is a common weed to flower and vegetable gardens and depending upon the size of the beds can be found in large enough numbers to be worth collecting. Gathering enough for a good mess can be deceiving though. The plants are delicate and largely water, so they cook down a lot if you desire them for cooked greens. My favorite use is to spice up and stretch a salad. You don’t need as much that way. In either case, select young plants that have not flowered much or most certainly have not gone to seed. Wash them off and use them like you would domestic watercress. You can also mix them in with a mild green like spinach to give it a little zip. My only suggestion is that you don’t overcook them. Bittercress is tender and will turn to mush in a hurry if you’re not careful. If salads are your pleasure, chop a few bunches of wild field garlic leaves and mix them in a salad with some bittercress. It livens the lettuce. Combine minced Cardamine and field garlic leaves with your favorite mild cheese, a little sour cream, and a little softened cream cheese for a smooth texture and cook in a crock-pot until thoroughly mixed. Add a little dill weed if you like. It makes a great hot dip for celery, carrots, pretzels, or even French fries. 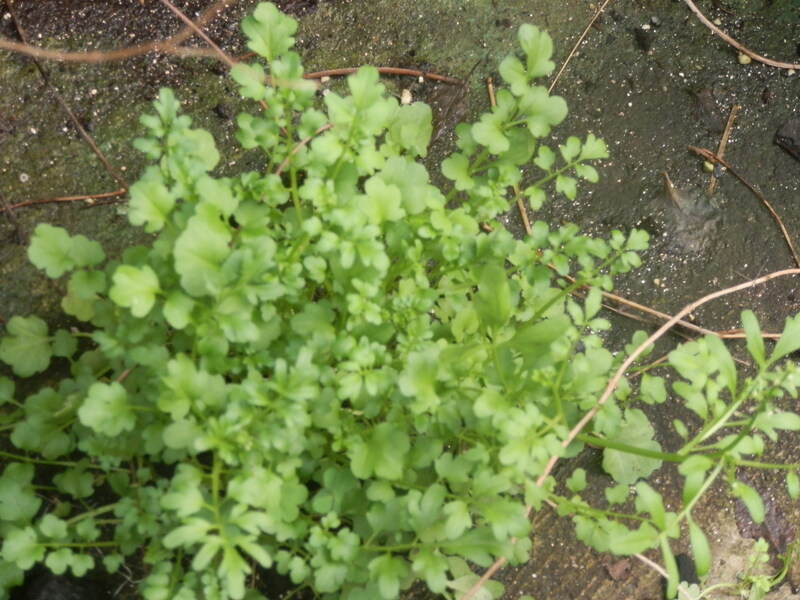 This entry was posted in foraging and tagged Cardamine, edible, Hairy Bittercress, hot dip, salad. Bookmark the permalink.